A solar powered lamp post light is a portable light fixture which contains adjustable LED lamp, a solar panel, and a rechargeable battery. Using solar lamp post is a great way to add beauty and lights to your home. This will not only enhance beauty of your house & surroundings but also add security and safety to your home. 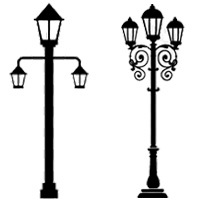 On this page we reviewed the best lamp-posts you can buy right now, these lamp-posts are comes in unique designs with a large variety, style and material. Most of them are made up of durable plastic and most of them does not even required wiring thus making it easy to install anywhere you want and can be moved easily. The solar lamp-posts are mostly used to mark walkway, a sidewalk or the areas around swimming pool and where you frequently roam around in a garden. There are many manufactures out there who produces these lamp-posts, the well known name are Gama Sonic, XEPA, and Paradise. The solar lamp post comes in various features and designs – you have a whole range of lights when it comes to purchasing one for your garden decoration. This market is really developing, we’re bringing you the most established models here. While it might be appealing to getting a unit that is expensive or recently produced we’d rather see people getting a model that has been around, and they’ll have a great experience. We’ll keep update this page as new models comes in and get a high customer rating and prove their place here on the best solar power lamp post page. Most vital thing to keep in mind while buying a lamp post is the design of the lamp, as its key to select a style that meets and fits in your particular need, so choose the one which best suits for your taste and budget. The Gama Sonic solar lamp is very quality lamp with height of 77 inches and six super-bright LED which are automatically switched on at dusk and goes off by dawn. The solar lamp is simple and easy to set up and with its base made to serve as planter, you can get a lamp and a planter in a single device in your home. I love the shining and lighting time which is about 10-12 hours. The solar lamp which are mostly put outdoors, have challenges with the effects of weather. 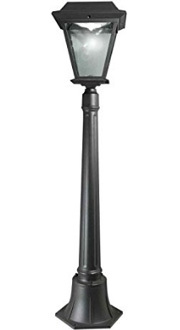 The Gama Sonic Baytown lamp-post is made of black polished beveled glass and cast aluminium that are waterproof and rust-resistance which gives much needed durability to the solar lamp. 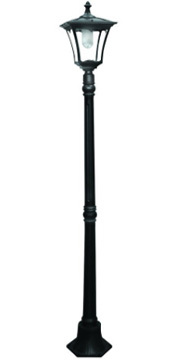 If you are just looking for the lamp head, we highly recommend to check this Gama Sonic Baytown ii solar lamp post. The paradise solar lamp is made by Sterno Home is currently Amazon Choice Product and its worth its price. The street styled solar powered lamp is an effective device for good lighting of any home or street as its super brightness from a 12 LED that gives the required ambiance. This is not a solar lamp with a planter base but its effectiveness is great. The lamp has a well programmed automatic dusk to dawn lighting and good capacity batteries charged by 4 large solar panels. All these functions are all embodied in a single device that is very easy to install while you never have to worry about its durability as it is made of rust and water resistance materials. When you buy this Paradise lamp-post LED it comes with 1 year limited warranty. Looking for a solar lamp endowed with stylish design and effectiveness? 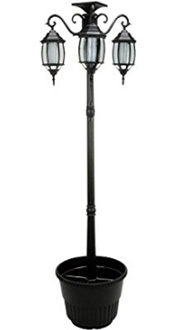 The PSW lamp fits perfectly into the description, the 80 inches tall with 3 head and a planter base possesses great features to lighten any outdoor garden, Yard or Patio. The PSW lamp-post consists of 3 lamp heads each with 6 sets of ultra-bright LED lights that shine so well to illuminate your home at dusk. It stores the solar energy trapped by solar panels into 2 batteries of 2500 mAH capacity of 1.2 Volts. Furthermore, the materials used for the solar lamp ensures and guarantees durability due to proven resistance to weather and environmental conditions. This solar lamp stands tail as one of the best in terms of good illumination due to its 3 headed structure. The iGlow outdoor solar lamp is a nice lamp for use in homes. It is made by iGlowand possess common features of a typical home solar lamp. It works with the 2 LED lights at the top compartments and these two LED are powered by rechargeable batteries which are charged by the solar panel of the lamp. The battery is of 3.7V and is said to last for 3 years before replacement. The solar panel is made using an improved crystalline panel that ensures high performance charging. The installation could be a little tasking as against what the manufacturers described but the lamp functions well as a low price, simple device. 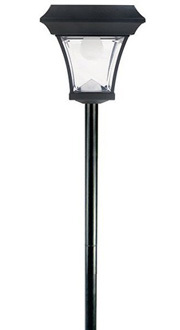 It’s a multi-purpose light you can either put it on a post or into the ground and it will work as a path light to illuminate your yard or patio. This one is the cheapest and affordable item on this list. This is a perfect motion detection security post lamp light from XEPA. The XEPA solar lamp is a 42 inches tall that is made to give your home the exquisite ambiance and illumination at night while it also gives you a sense of safety against intruders and supposed criminals. Just like all other solar lamps for homes, it has a solar panel that traps energy to charge the battery which powers the super-super-bright LED. The base and other components are easy to install while the lamp is made with durable materials that can easily stand again bad weather conditions for long time. You can install XEPA solar lights at your outdoor garden’s doors and it will work as a safety device with the motion detector ability of the XEPA solar lamp is active at 10 feet motion range and at 160 degrees wide angles. Drawback is that the lamp can only illuminate for 4 hours which is a reflection of the capacity of the battery. However, looking at its features you can easily overlook this con, isn’t it?